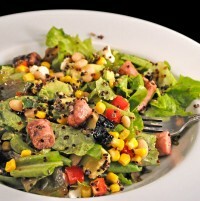 Southwestern Salad with Grilled Sausages; where’s my day? I’m taking a lot of poetic license with the names in this salad. The ‘French’ vinaigrette is because it reminds me of the red Kraft French Dressing so popular in restaurants when I was young. The quinoa, corn, beans and peppers give the salad a ‘southwestern’ flavor. The oregano, Greek olives and feta a Mediterranean flavor. The quinoa I used was the dark red variety – just for fun. Use fresh sweetcorn if you have it – ’tis the season, after all. Feel free to add a dash of Green Tabasco. Put the quinoa and chicken stock in a small saucepan. Cover and simmer until done, about 15 minutes. Mix ketchup, vinegar, mustard and honey. Slowly add olive oil, whisking constantly. Set aside. 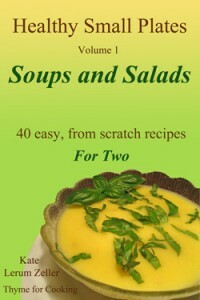 Tear the lettuce and put into a large salad bowl along with the herbs. Cook the sausages on barbecue grill or sauté in nonstick skillet until done, 8 – 15 minutes, depending on size. Remove and cut into 1 1/2″ (4cm) lengths. Add beans, corn, pepper and the rest of the vinaigrette, toss well. Add sausage, olive and avocado, toss gently. Sprinkle quinoa, feta on top and serve. Once again, my day is almost done and I’m trying figure out what happened to it. My question for me is whether I’m wasting time or just losing speed or just not staying focused. There is always just so much to do in the summer. I started my morning with a simple goal for the day: to get 12 photos ready for use on this blog. Now, that’s not a big project, but it does take some time. Each photo had to be sized differently for the various social media sites and I had to actually select the photos I wanted, but still I estimated that it would take me 2 hours, maybe 2 1/2. After walking the dogs and having breakfast I grabbed coffee and went to my computer. I quickly went through the usual morning routine of handling emails, checking various sites, and so on. Then I got a second coffee, started Photoshop and got ready to work. I glanced at the time and noticed it was after 9:00. I had to get the watering done before it got too hot. I finished my coffee and went out to water the potager and the herb garden. I was back at my desk, with a third coffee by 11:00. Oops – forgot to start some laundry…. Again, at my desk, I worked until 12:00. Guapa and Bonnie came running to remind me it was time for our daily work / walk routine. While I was out with the dogs I noticed that there were still a lot of nice plums on one of the trees. I decided a Plum Crisp would be good. After we finished our walk I went back to pick some plums. As long as I had my basket I went to the potager and picked beans, tomatoes and zucchini. I noticed that some of the tomatoes needed tending and there were a few weeds so I took care of that as well. An hour later I put my basket full of fruit and vegetables in the kitchen. The dogs had prickly stuff in their paws from our walk. Well, they needed a good brushing and trimming anyway…. Back outside to groom the dogs. Once I was done with the dogs I decided to clean their beds and sweep the floors. All of a sudden it was 3:00 – time to exercise, then shower, and have lunch…. Which took me to 5:00 and time to walk the dogs again, then feed them. This was followed by finishing the laundry and making the plum crisp. I decided the tomatoes could wait until tomorrow before peeling and chopping for the freezer, but I did need to organize the freezer. It needs to be packed very efficiently to make room for everything. I rearranged the stuff in the freezer. Finally, I was back at my desk at 6:30 to finish those photos. But wait…. It’s Sunday and I need to post a recipe! And here I am – almost 9:00 in the evening and I’m about to finish what I started 12 hours ago. And that’s how my days go. Is the rest of the world more organized? It may not have been an organized day but it certainly was productive! I actually like days such as yours when I flow through without much of a plan and look back at the end with a sense of accomplishment. The only thing missing from your day was that it didn’t follow your preconceived notion. ? Katie – I have many days like that…where does the time go? The good news is: there is always a new day to finish what we could not finish today. Some days just go like that and I do my best to go with the flow…sounds like you did too. Love your salad…yummy wholesome ingredients! Amerloc, all of my days seem to go that way lately lol.